Raymond van Barneveld won through to the second round of the Betfair World Matchplay with a 10-4 triumph over 21-year-old Michael Smith, and set his sights on claiming the £100,000 title for the first time in his illustrious career. The five-time World Champion, who hit five maximums in a classy first round display, was delighted to continue the form which saw him take victory at the European Darts Open in Dusseldorf a fortnight ago. “Winning in Germany two weeks ago was a massive confidence boost,” said van Barneveld, who will face Terry Jenkins on Wednesday night in the last 16. “That meant a lot to me. I’m playing well and the belief is there. ‘Barney’ hit two 140s in the opening leg, which he won against the throw, taking out 64 on double four. The Dutchman found the same bed to go two nil up, before Smith got off the mark on double eighteen. 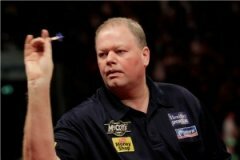 van Barneveld took leg four before the pair exchanged 180′s in the fifth, with ‘Barney’ firing in two maximums before grabbing a second break of throw, extending his lead to three legs. ‘Barney’ hit his third 180 before taking out 96 to make it 5-1. Smith pulled a leg back before van Barneveld’s fourth maximum helped him on his way to the eighth leg. The ninth promptly followed when he grabbed his third break of throw and he held to move within two legs of victory. St Helens youngster Smith reduced van Barneveld’s lead to 8-3 but ‘Barney’ hit tops to take the twelfth leg. He hammered home is fifth 180 in the next leg, but ‘Bully Boy’ lived up to his nickname, taking out 93 on the bullseye to prolong proceedings. ‘Barney’ sealed the win though, posting double eight to progress into the second round. See Barney in action at The Untouchables,Eastbourne on Friday 19 October.